This is also a great resource for Master Gardeners. 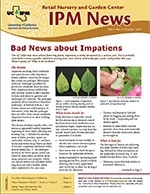 The latest issues have information on a downy mildew affecting impatiens, 2 new stink bugs, deer resistant plants (fact or fiction? ), brown widow spiders in Southern California and much more. If you'd like to sign up to receive an electronic copy, check out their website.